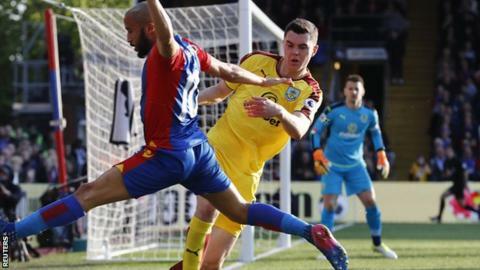 Manchester United are interested in re-signing £25m-rated Burnley defender Michael Keane. The 24-year-old was sold to the Clarets for £2m in 2015 by then-United manager Louis van Gaal. He made his England debut on 22 March this year and is shortlisted for the Professional Footballers' Association young player of the year award. Any deal for Keane would allow United to activate a 25% sell-on clause from the player's initial transfer. If the transfer did go through, it would be the second summer in succession that United would have bought back one of their former academy players following Paul Pogba's world-record £89m return in 2016. United manager Jose Mourinho has identified his defence as an area he wishes to improve in the summer and is expected to make significant changes to his squad. Mourinho's men cannot finish in the Premier League top five after they lost against Tottenham Hotspur on Sunday coupled with Arsenal's 2-0 win against Sunderland two days later. The Red Devils have two games remaining, starting with a trip to Southampton on Wednesday before hosting Crystal Palace on Sunday. Stockport-born Keane played in the same 2011 FA Youth Cup-winning side as Pogba and made five senior appearances for United. He joined Burnley after spells on loan at Leicester, Derby and Blackburn. I'm surprised Manchester United got rid of him in the first place. We took him on loan at Derby a few years ago when he was 19 or 20 years old. He wasn't physically ready at that stage. He came in as cover for 10 games and was absolutely outstanding. The potential future was there for all to see. He was a modern centre-back - he could get a goal from set-pieces and was aerially very good. He could also bring the ball out from the back and step into midfield. Michael has since cemented a place at Burnley and established himself as a top centre-back.